Obama calm: Said the pressure "nothing compared to folks ... getting laid off"
(CNN) -- The cool of Barack Obama was very much on display on a warm day in Boston's Christopher Columbus Park during the summer of 2004. 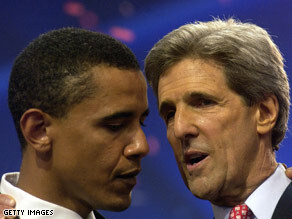 John Kerry, right, and Obama confer at the 2004 DNC, where Obama wowed the crowd with his keynote address. It was going to be a big day for the Democratic nominee for the U.S. Senate from Illinois. In a few hours, on that night, July 27, 2004, he was to give the keynote address to the Democratic National Convention at the Fleet Center about a mile away. But as he gave a lunchtime speech on environmental policy to a leisurely crowd of about 100 people at the green space on Boston Harbor, he was relaxed and loose, seemingly unconcerned about what was ahead. Taking notes amid the crowd, I hoped to get a few minutes with the candidate. I'd been told about his vaunted charisma -- my two brothers, both of whom live in Chicago, had mentioned his oratorical gifts -- but in person Obama seemed familiar, even a touch wonky, as he talked about asthma rates and the Bush administration's environmental record. I chatted with Obama's press attaché and with a Chicago Tribune reporter, David Mendell, as the speech wound down, and was offered a ride in a nondescript minivan back to the Fleet Center. Even then Obama was attracting attention; several members of the audience gave him enthusiastic greetings as he left the scene to get in the van. In the front passenger seat of the van, the rail-thin Obama, obviously hungry (he later told me he'd lost eight pounds since the beginning of the campaign), chewed on a sandwich and joked with the other passengers as I peppered him with questions during the 20-minute ride. He answered with deliberate thoughtfulness, though he'd probably heard at least a few of them dozens of times already. Was he worried about the speech, the kind of spotlight that had made political leaders including William Jennings Bryan, Mario Cuomo and Ann Richards national figures? "There's going to be some adrenaline," he said, after taking off his tie and unbuttoning his white dress shirt. "But the pressure I'm experiencing is nothing compared to folks I'm meeting getting laid off. ... That's real pressure." And what about the Senate race? Illinois Republicans were in disarray and better-known, better-funded candidates had fallen by the wayside, with Obama seemingly now a sure thing for the seat. "Three months is a lifetime in politics," Obama replied. By now, Obama's rise is well known: the son of a Kenyan father and Kansas mother, raised in Indonesia and Hawaii, community organizer, Harvard Law Review editor, author, law instructor, politician. He's been astutely revealing in his books, notably his 1995 memoir "Dreams From My Father," and his presidential campaign has reflected his demeanor. But none of it was foreordained. In the fall of 2003, when he was still an Illinois state senator, he was one of seven candidates running for Peter Fitzgerald's vacated U.S. Senate seat. One of his opponents was a multimillionaire; another was the Illinois state controller. Obama was unknown and underfunded. "I remember asking [at one event], 'Where is he?' " Mendell recalled at the Boston rally. "And somebody said, 'He's parking the car.' "
Mendell's description of Obama's 2004 race offers echoes of his painstaking, grassroots 2008 campaign. Obama had some good luck: The multimillionaire, Blair Hull, had details of his ugly divorce come out during the campaign. But Obama's success was also a tribute to his meticulous resolve. "He ran a really smart primary campaign," Mendell said. "He waited until the ninth inning to score all his runs. ... It was masterfully done." Mendell later wrote a book on Obama, "Obama: From Promise to Power." Not even Obama knows for sure how he landed the keynote slot. In his 2006 book, "The Audacity of Hope," he writes, "The process by which I was selected ... remains something of a mystery to me." He didn't meet 2004 Democratic presidential candidate John Kerry until the Illinois primary was over, he recalls; he spoke at a Kerry fundraiser but didn't know he'd be giving a speech at the DNC until weeks later. Even then, he didn't know he'd deliver the keynote until told by Kerry campaign manager Mary Beth Cahill. According to an August article in The New Republic, Obama was selected over some better-known names by the Kerry brain trust, which included Cahill and adviser Robert Shrum, for various reasons. As an African-American, he would help attract minority voters; Obama was also youthful and energetic, qualities that the Kerry campaign wanted to display on television. And he had a good rapport with Kerry, Mendell told the magazine. "It's Kerry kind of looking at him [at the fundraiser] and picking up tricks from the rookie," Mendell said. "That was the event where he really impressed Kerry." The keynote, of course, electrified the nation and introduced America to the man who would become president. "We are one people, all of us pledging allegiance to the stars and stripes, all of us defending the United States of America." He gave a hint of those words in the van on the way to the Fleet Center. He was going to give a unifying message, he said, not one that reinforced the "slash-and-burn politics" that had divided the country. "People know [President] Bush isn't the cause of every problem in the world, and they know the Democrats aren't a bunch of raving lunatics," he said. Having finished the sandwich, the van approaching its destination, and prepared to enter the Fleet Center for another round of interviews. When that was over, he was going to take a jog. "Then a long shower," he added, "and maybe a nap." History may have awaited, but he wasn't perturbed. Then again, maybe he knew something the rest of us didn't. He'd completed the speech a couple weeks earlier, and he must have suspected its power. In a New Yorker article by Ryan Lizza, Obama's friend Marty Nesbitt also recalls the buzz building around Obama that day, and a clue Obama gave as to what was next.